Tonight, with Jen enjoying all the fine cuisine of Salt Lake City hotels, I returned home to a fridge full of odds and ends and leftovers. 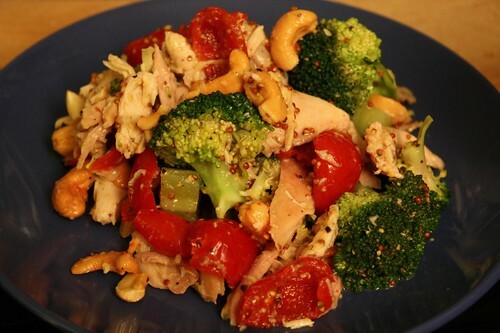 I put together this chicken salad with the remaining beer can chicken, broccoli, peppadews, salted lime cashews, and Maille whole grain mustard. I've gotta say that this was far tastier than I'd imagined when I was hastily throwing it together for a quick dinner. 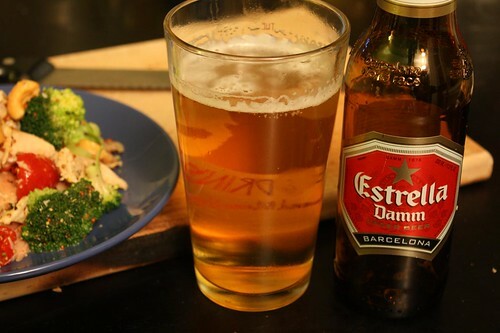 For beer I had Estrella Damm from Barcelona. This prompted me to walk around my apartment, all by myself, repeatedly muttering: "Barthelona." This is one of those rare occasions I've found that it's possible to annoy myself. Beer Advocate only gives this a 'C' rating. This is surprising because I found this beer to be quite enjoyable. Of course, the type of people who would register on Beer Advocate and review a beer are bound to find fault in most things in life. Beer is only one of those things. It's for that reason that I've joined Beer Advocate to review beers! Of course I kind of despise the review and grading system of any food or beverage, but this is more of a way for be to more easily catalog the beers that I've had. If there's one thing I like it's the needless cataloging of events in my life. It's like mother's milk to me.